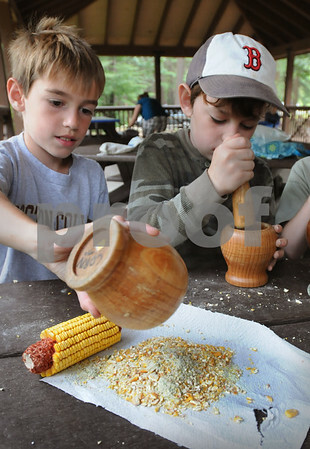 Newburyport: Jackson Card, left, pours his ground corn onto a paper as Jack Doyle, both 8, continues to grind his in the pavilion at Moseley Woods. The two were at Newburyport Youth Services camp in a program of life of the American Indians presented by Joann Healey. Bryan Eaton/Staff Photo Newburyport News Thursday July 16, 2009.